Even though we prayed to the goddesses that this day would never come, it has arrived, dear readers. Bidding the nation farewell, Michelle Obama gave her final interview to Oprah Winfrey (*insert uncontrollable weeping*) at the White House recently, and the pair looked back on the Obamas’ many achievements over the last years. Michelle and Oprah also wore coordinating green dresses, which — obviously — took the interview to the next level. We doubt Oprah and Michelle called each other ahead of time to plan coordinating ensembles, but they certainly complemented each other perfectly. Donning one of the year’s top trends, Michelle looked chic in a striped green frock with velvet embroidery by Preen, while Oprah rocked a custom knee-length dress by American designer Brandon Maxwell. The result was regal eye candy. 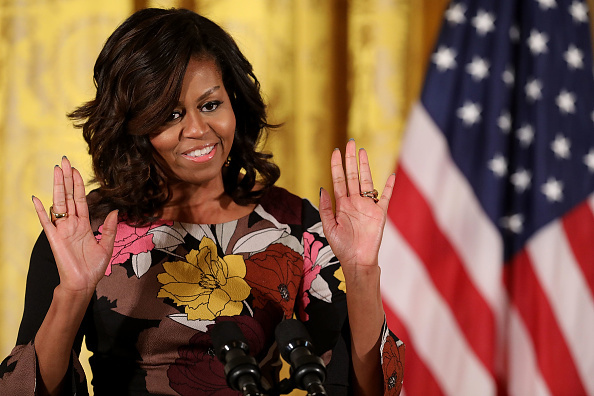 With a new, non-White House life on the horizon, we’re not surprised to see Michelle Obama embracing the spirit of revitalization. On to greener pastures!